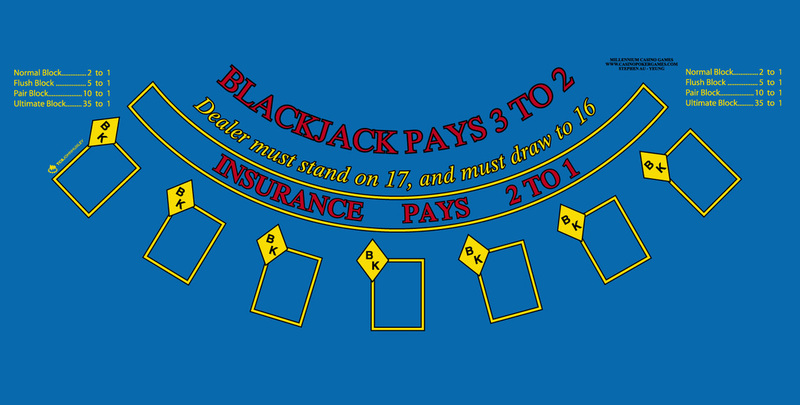 Blackjack Block® Bonus-bet is based on the player's first two cards and the dealer's up card. The bet wins if the dealer's up card matches the suit of one of the player's cards, and the player's card is higher. There are higher pays if the player's cards are a pair, suited or both. ​Ultimate-Block: A Block consisting of two cards both of the same rank, both higher than and both of same suit as the dealer's card. Pair-Block: A Block consisting of two cards of the same rank, both higher than, and one of them the same suit as, the dealer's card. Flush-Block: A Block consisting of two cards of the same suit and one/both cards are higher and in the same suit as the dealer's card. Normal-Block: A Block consisting of one card higher and in the same suit as the dealer's card. Push: If one of the Player's cards matches the Dealer's card in both rank and suit, then is a push.